At Mountain Journeys we offer a unique range of events to test your abilities in the mountain environment. From single day to multi day ‘mega trips’ we have something for everyone. Our challenge events require minimal travel once at departure point. This gives you more time on the mountain, more time enjoying the outdoors & more time enjoying the challenge. What are you waiting for, give us a call and let's make it happen. The Lake District contains some of the most beautiful scenery in England. It has hundreds of fells which create a vast terrain of rugged mountains. There are 4 fells which exceed the 3000ft contour. These can be ascended during the course of a weekend, meaning you have then climbed the 4 highest peaks in England, quite an achievement. We usually begin with a day on the Scafell range. 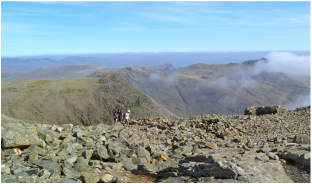 Although Scafell & Scafell Pike are very close to each other, cliffs bar easy access between the two, so this makes for a big day out with lots of ascent and descent. By comparison, day 2 should feel easier! Skiddaw and Helvellyn are both climbed via well maintained paths that are never overly steep. This is a good way to enjoy and get to know the Lake District and give yourself a challenge to work towards. 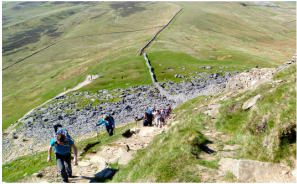 The 15 Peaks Challenge is an attempt to climb all fifteen 3000ft peaks in Wales over three days. This is a beautiful high level traverse passing through untamed mountain areas. It's physically demanding that's not to be under-estimated, but a fine achievement once done. In the evening we can relax and reflect on the achievements of the day. The Welsh Peaks offer glorious mountain scenery and this is a magnificent way to enjoy them all. The first day we traverse the Carneddau for a great high level walking day. It's a big day out and plenty of stamina will be required. The second day involves scrambling on Tryfan, followed by the mighty bulk of the Glyderau. I slightly shorter day but still very demanding. 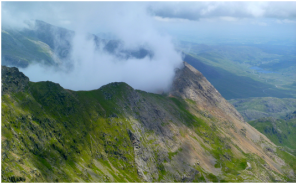 Day 3 involves more scrambling and a ridge walk across the Crib Goch arête, before walking to the summit of Snowdon, the highest point in Wales. The days aren't all just walking, so this gives a whole new level of excitement. Day’s 2 & 3 in particular require a head for heights as the exposure is quite dramatic. On first appearance, Tryfan can appear impenetrable. However our route allows for variation in difficulty levels and is actually within the capabilities of most hill walkers. Crib Goch requires a good head for heights, surefootedness and steady nerves. There is no hiding the fact that this is a narrow, knife edge ridge. We will allow plenty of time for this. To complete this route is to undertake one of the great outdoor challenges in the UK. It will be a tough day, but worth it for that feeling of satisfaction. The scenery is dramatic and ever changing, wildlife abounds as do carpets of flowers encouraged by the nutrient rich soils of the Limestone pavement, which in itself is an incredible sight to behold. We start and finish in the sleepy village of Horton-in-Ribblesdale. From here we can observe much of the route that awaits our discovery. The 3 highest mountains in Yorkshire in a day.